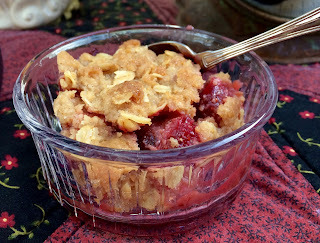 We've had some warm days, almost to the 80's, here in Texas, and dessert can be shared out on the patio. Some of you may remember the McKenzie Childs look alike tea kettle that my son, Mike, painted for me. Would you like a scoop of vanilla ice cream or some whipped cream on your crisp? You can see some of the berries from my evergreen East Palatka Holly tree in the background. My daughter and I used to buy Santas for each other, and this Santa slipper-clad one is a favorite. 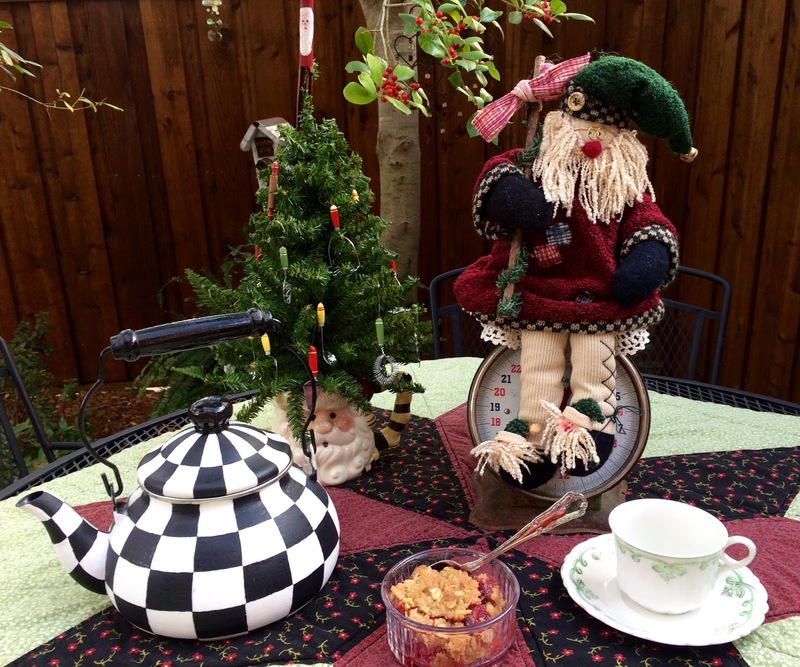 I thought the trim on his outfit, mimicked the check of the tea kettle. This is a perfect dessert for the holidays and is such a pretty color. I cut the recipe in half, but am giving you the full recipe. You can make the topping and the filling ahead of time, if you'd like and then bake before needed. Pulse the flour, sugars, cinnamon, and butter in food process pr until the texture is like coarse crumbs. Transfer to a medium bowl, stir in the oats, and use your fingers to pinch the topping into peanut-sized clumps. Refrigerate while preparing the filling, or store in a food safe bag, until needed. 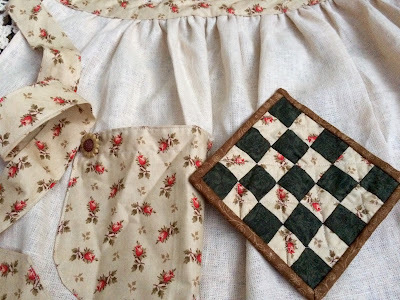 Bring the cranberries, 3/4 cup of the sugar, and water to a simmer in a Dutch oven over medium-high heat and cook until the cranberries are completely softened and the mixture is jam-like, about 10 minutes. Scrape the mixture into a bowl. Add the apples, remaining 1/2 cup sugar, and dried cranberries to the Dutch oven and cook over medium-high heat until the apples begin to release their juices, about 5 minutes. Off the heat, stir the cranberry mixture and tapioca into the apple mixture. Pour into a 13 x 9" baking dish set on a rimmed baking sheet and smooth the surface. (If making later, cover and refrigerate this without the topping). 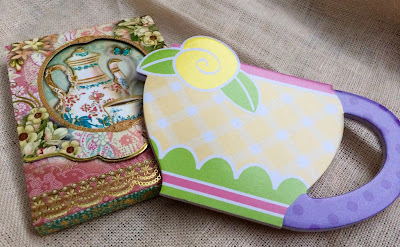 Cissy and I did a fun edible treat recently. 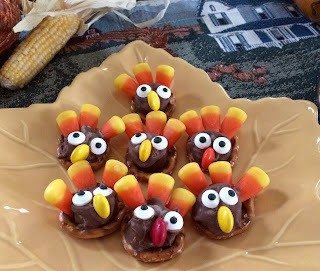 Aren't these Turkey candies adorable? Let's enjoy a couple with a cup of tea, shall we? 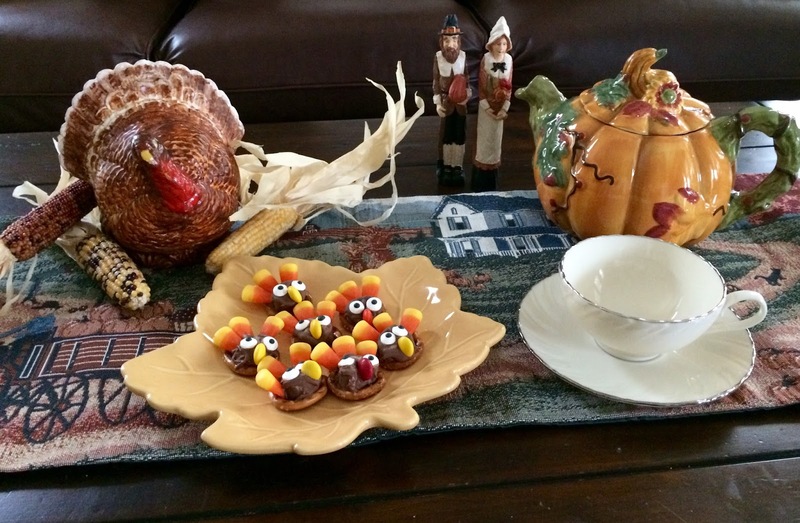 I saw these cute turkeys somewhere on the internet, and Cissy and I had fun making them. They're a little messy to do, but aren't they cute? Place the pretzels on a parchment lined baking sheet. Unwrap the Rolo candies and place one on each pretzel. Put the baking sheet in the oven for about 1 minute, just to get the Rolo a little melty. Place the googly candy eyes towards the upper part of the Rolo. 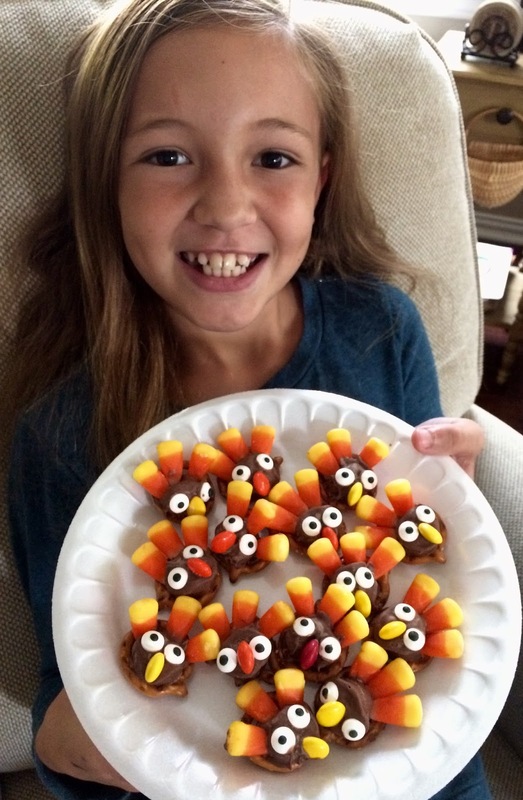 Add the M&M, or Reese's Pieces for the beak, and then place three Candy Corn in the back of the Rolo for the feathers. 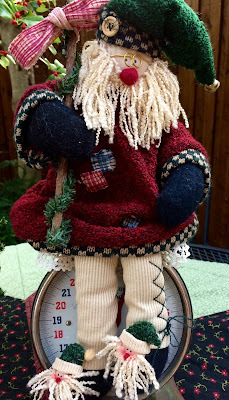 Look what Cissy was able to take home to her family! 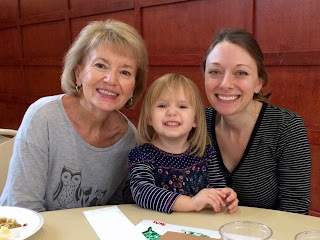 I recently had the happiness of attending the Thanksgiving Lunch with my daughter and Cissy. 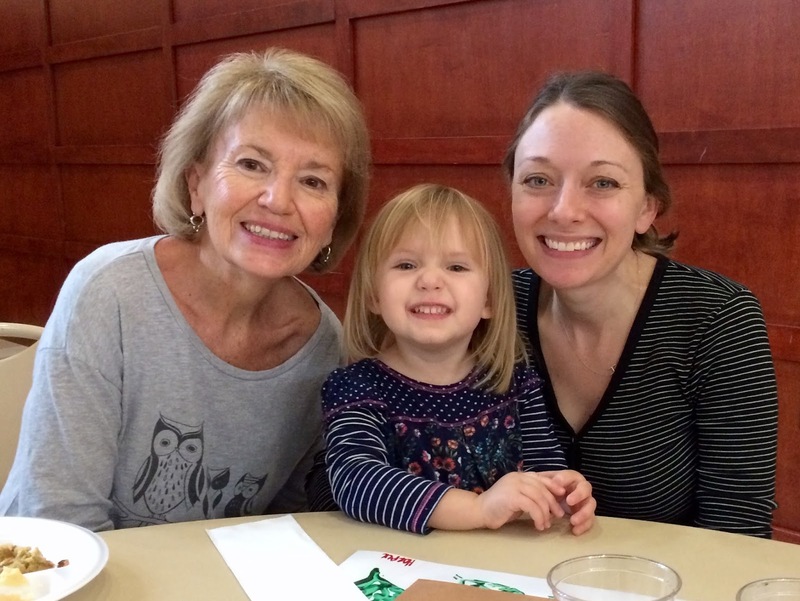 I also was happy to watch Harper's adorable Thanksgiving program and Feast, with my daughter-in-law. Baby Hayden was busily sleeping away! I can hardly believe that I have been participating 11 times in Stephanie's exchange, from The Enchanting Rose. 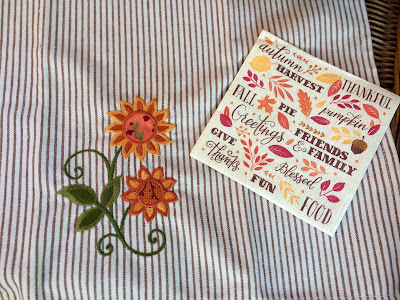 I was the lucky recipient from Doniene, who has two blogs, Doniene's 365 Days-2017 and Now It's Just Quilts! I was excited like a little kid on Christmas morning when my package arrived on my doorstep! 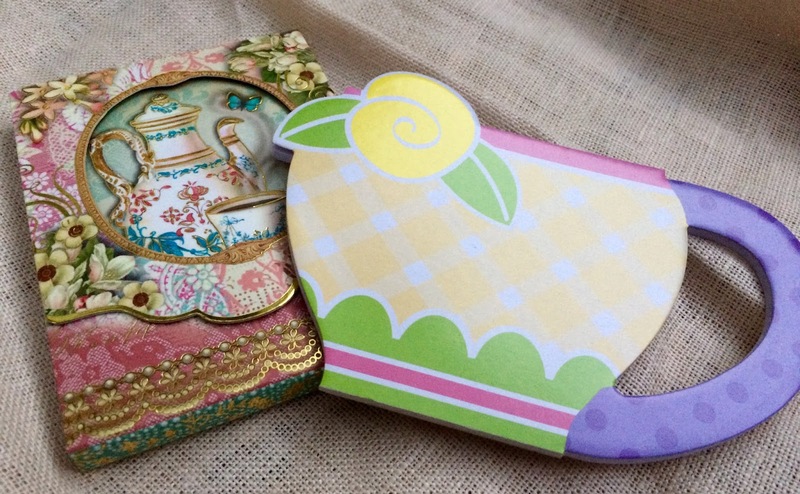 I received these darling note pads. I'm forever needing these. Aren't you? 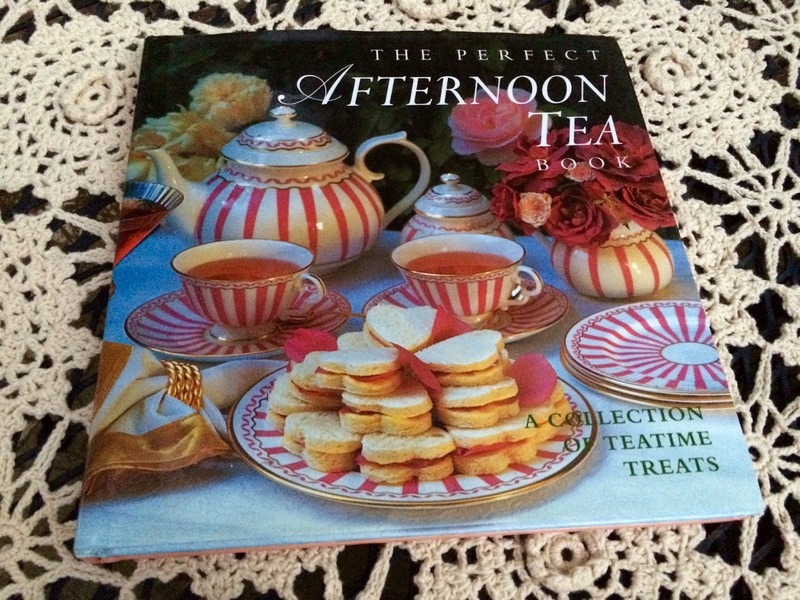 I love cookbooks and read them like novels, from cover to cover. I have found so many teatime treats that I'd like to make from this Afternoon Tea Book. Doniene made me this beautiful apron and quilted a matching potholder. Isn't that so special? I received not one, but two teacups! 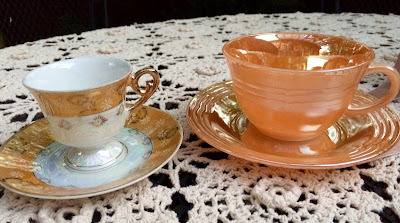 I have always wanted a Fire King peach luster teacup, on the right! I'll bet that Doniene sent the demitasse cup of the left for one of my granddaughter's to use, don't you? 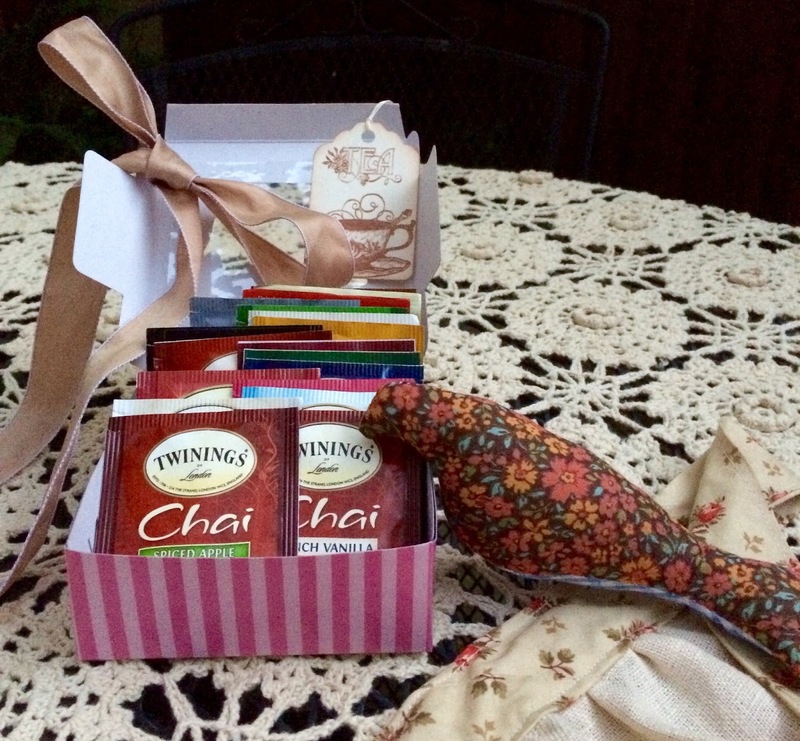 Doniene made the sweet bird that's peeking into the box of tea that she sent...so many flavors for me to choose from! 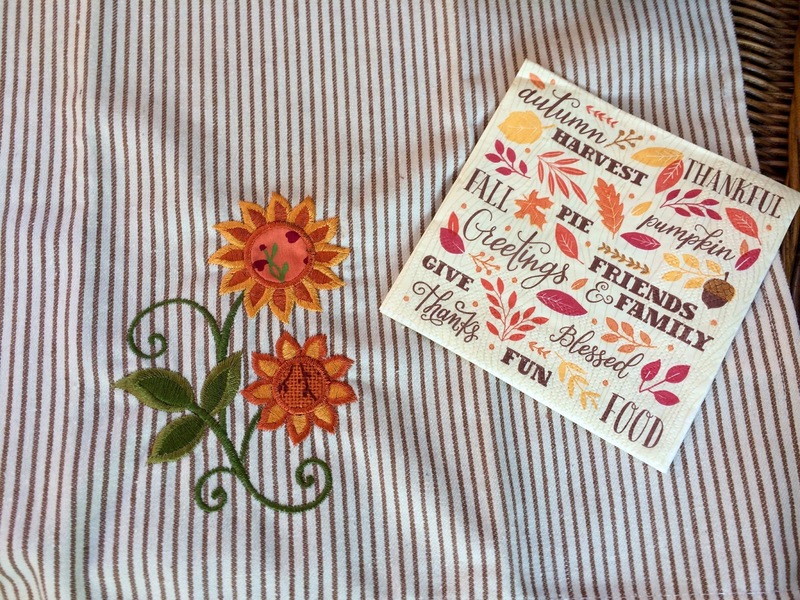 Thank you, Doniene, for all your thoughtful, and most appreciated gifts! You certainly spoiled me and made me feel special. 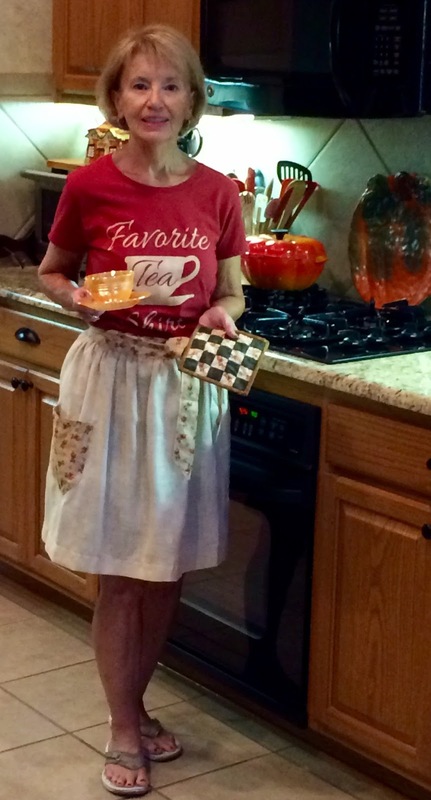 I donned my Favorite Tea Shirt, that my dear daughter gave me, to enjoy a cup of tea! 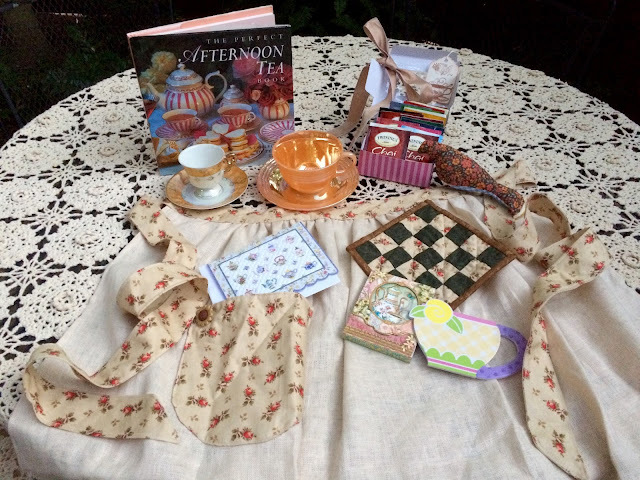 I gifted Laura, from Decor to Adore as my teacup partner, and you can see what I sent to her here. I've had the pleasure of meeting sweet Laura, and she is just a delight! Thank you to dear, sweet Stephanie, our hostess, who puts so much time, effort and love in these exchanges. Please visit The Enchanting Rose on November 8th to see all the participants. 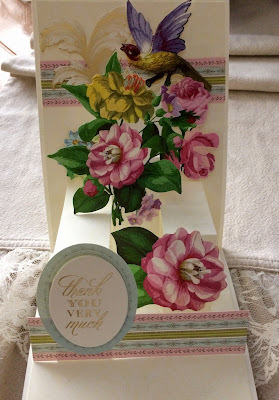 Laura sent me this beautiful handmade, pop up card as a thank you. Wasn't that thoughtful of her? We all love to feel appreciated, don't we?